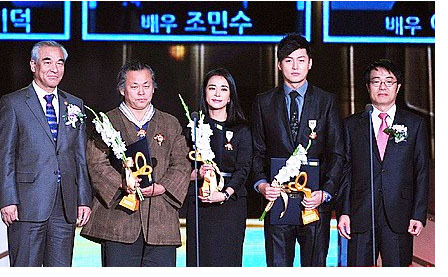 KIM Ki-duk and the leading actors of Pieta received Orders of Cultural Merit at the Korean Popular Culture and Art Awards 2012 held on November 11th at the Olympic Hall of the Olympic Park in Seoul. At the Cabinet meeting on November 6th, the Korean Ministry of Culture, Sports and Arts selected 10 people including KIM and Psy (singer) to confer Orders of Cultural Merit to. KIM, the director of Pieta, was highly praised for receiving the Golden Lion at the Venice International Film Festival with outstanding directing and unique film. KIM received an Eun-gwan Medal (Silver Crown) and LEE Jung-jin and CHO Min-soo each received an Ok-gwan Medal (Jeweled Crown). Meanwhile, CHO has been nominated for the Best Actress award at the 6th Asia Pacific Screen Awards, which is going to take place in Australia on November 23rd. Besides her, Nameless Gangster : Rules of the Time has been nominated nomiated for the Best Film award and the Best Actor award (CHOI Min-shik). The director YOON Jong-bin will make an appearance at the awards.